The Shipibo Conibo Center is a broad experiment in art, culture, politics and the afterlife— an art project in the form of a 501 (c) 3 nonprofit cultural organization headquartered in West Harlem, NYC. Within the contemporary setting of global art and knowledge production, the Center promotes and perpetuates the creative life-ways of the Shipibo-Konibo People of the Peruvian Amazon in such a way that would benefit its practitioners. With a focus on indigenous self-determination and territorial sovereignty as well as visual arts, music, and ethnobotanical research— which in the Shipibo-Konibo lifeway are inseparable realms— the organization’s mission is motivated by the conviction that indigenous identity does not belong to a romanticized ancient age, but rather to a technologically-anchored and sustainable future. The Shipibo Conibo Center is constituted in the spirit of artist and filmmaker Leonor Caraballo to continue her work in this field by means of a broad unconventional approach that distinguished her throughout her life, death and artistic practice. 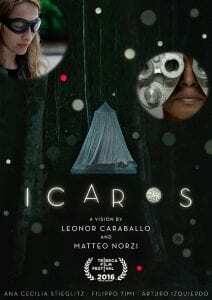 Leonor’s interest in these subjects started when she was introduced to shamanism and plant medicine travelling the Amazon and up and down the Ucayali River during the making of Icaros: A Vision, a feature film made alongside Matteo Norzi and Abou Farman. Having been diagnosed with a terminal disease prior to the shoot, she never backed away from dedicating herself to the project until the very end, animated by a superior degree of urgency: acknowledging the power of plants and the contemporary relevance of indigenous wisdom is the only way to change the jeopardized future of the Amazon – itself like a dying patient. Icaros is the seed, the first major project of collaboration with indigenous artists, which is germinating into the ideas behind the Shipibo Conibo Center.